High School Jaime Jaime Beth Wogsland was born March 26th, 1984 to Jim and Sally Wogsland in Baltimore, MD. Her middle name was to have been Elizabeth, like her mother, but that would have made her initials JEW, so they shortened it to Beth. She also lived in Pennsylvania and California as a baby, however, Jaime lived in Georgia for most of her young life. She attended Dolvin Elementary School, Medlock Bridge Elementary School, Taylor Road Middle School, and Chattahoochee High School; all in Alpharetta, GA. After graduating high school in 2002, she studied for 2 years at Georgia State University in Atlanta. Her roommate, Sara, had a brother, Amir Golshani, who soon captured the bulk of Jaime's attention. 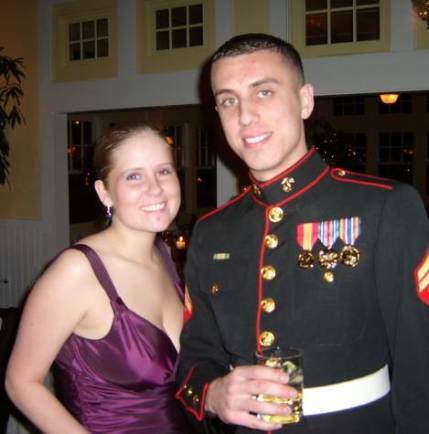 Jaime started dating Amir, whom she had known since high school, in July 2003. A year later in May of 2004 she moved to Norfolk, VA where Amir was stationed. While there she attended a semester at Old Dominion University, also in Norfolk. Jaime and Amir were married there May 11th, 2005. Amir was transfered to the west coast in the summer of 2005 and they made a new home together in San Diego. This led Jaime to transfer colleges again, beginning her attendance San Diego State University in the spring of 2006. In summer 2009 Jaime & Amir moved back to their hometown in Georgia where their daughter Alexandra was born later that year. Sally Marshall Wogsland 1955 - ?